The Buffalo River / Eureka Springs Route takes you through the Buffalo River National Park. Ride across the 1930’s iron truss Pruitt Bridge and see one of the greatest concentrations of free-grazing elk in the country. Stop at the Elk Education center to learn more about these magnificent creatures and how they came to make their home in Arkansas. Sit with the locals at the Ozark Cafe on the town square in Jasper and return back to Eureka Springs and a stay at the Crescent Hotel. Biker’s Best rates start at just $109. Route Distance: 110 miles with 378 curves. The PEEL FERRY route will start by departing Harrison on Scenic Highway 7 North. Follow Highway 7 to Highway 14 East. Follow Highway 14 for a very short distance to AR Highway 268 North. Highway 268 North will intersect with AR Highway 125 where it will pass the Corps of Engineers Park on the right side. Highway 125 dead-ends at the Peel Ferry Crossing. Once you are on the Missouri side of the lake, continue traveling on Missouri Highway 125 to Highway 160 West. Highway 160 will intersect Highway 76 West just east of Forsyth, Missouri. Take Highway 76 West through Branson until it intersects with Highway 65 South. Be sure to enjoy Branson before heading south on U.S. Highway 65 to Harrison. The Osage Trail is a great ride for scenic beauty. It takes you through small towns, scenic countryside and mountain overlooks. In the fall and winter, bald eagles are prevalent around many of the hillsides and fields. The trail meanders through the small community of Osage. Osage was a stopping off point in the old days for travelers heading to Northwest Arkansas. The Osage Clayworks is located in the historic Stamps General Store built in 1901. It is a great representation of the buildings of the times. Directions: Leave from Harrison and travel west on Highway 392 through the small communities of Capps and Batavia. Highway 392 will meet with U.S. 412/62 where you will head west through Alpena on Highway 62. Follow Highway 62 West through Green Forest to Highway 103 South. The south intersection is on the west side of Green Forest. Don’t be confused with Highway 103 North that meets in the center of town. Follow Highway 103 South to U.S. Highway 412 East. Travel east for a short distance on Highway 412 to the intersection again with Highway 103 South at Osage. Highway 103 will take you to Highway 43 North that leads back to Harrison. The Jasper Disaster has the name for good reason. Mile for mile, this route is the curviest riding route. The route encompasses the most scenic section of Highway 7, follows Highway 74 over the mountains and joins Highway 43 in Boxley Valley. The scenic beauty of this route is incredible with wonderful overlooks, massive drops in elevation and many opportunities to see wildlife like deer, turkey, elk and eagles. 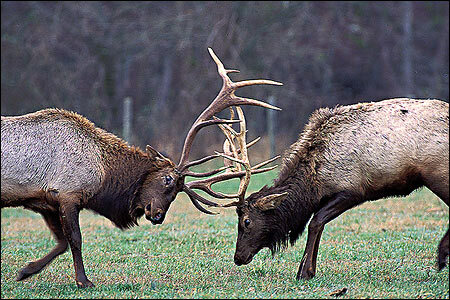 Be sure to enjoy the Elk Education Centers along the route as well as Boxley Valley to view the elk herd. Directions: Depart from Harrison, AR on Scenic Highway 7 South to Jasper. Turn on Highway 74 West and travel to Highway 43 North in Boxley Valley. Take Highway 43 North back to Harrison, Arkansas. The Ozark Moonshine Run and DragonTail is without a doubt the most picturesque route in the Ozark Mountains. 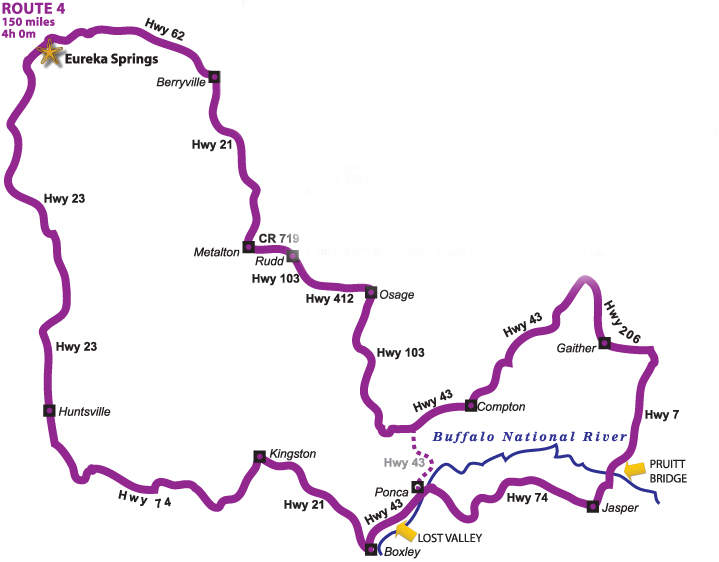 The route encompasses parts of Scenic Highway 7 and winds through the deepest parts of the Ozarks and Buffalo National River. Along the route you can expect to see magnificent views, ancient bluff lines and the possibility of seeing majestic elk grazing in their natural habitat. Parts of the route makes you feel like you stepped back in time to a slower paced lifestyle. You will see many attractions along the way so take your time and enjoy the scenery but be careful of the many curves along this route. Some parts can be tricky and slightly dangerous. Directions: Head to Harrison, Arkansas and turn on Scenic AR Highway 7 South heading to Jasper, Arkansas. Travel through Jasper, AR on AR Highway 7 to AR Highway 374 East on your left. AR Highway 374 will join AR Highway 123 where you will turn right. Follow AR Highway 123 through Mt. Judea (pronounced Judy) until its intersection with AR Highway 7 North. AR Highway 123 splits, so be careful to follow the route leading to AR Highway 7 North. Follow AR Highway 7 North to the intersection with AR Highway 16 on your left. Highway 16 will take you through the communities of Deer, Nail and Swain. AR Highway 16 intersects with AR Highway 21 where you will travel north into Boxley Valley. Through the valley, be on the lookout for Elk that graze the fields and sometimes cross the highway. Follow AR Highway 21 to the intersection with AR Highway 43 North. AR Highway 43 North winds through Ponca back to Harrison, AR. Leave Eureka Springs early to see the sunrise over amazing vistas like the Bluebird Hill Overlook. Ride through the Buffalo River National Park and stop to watch elk graze near Boxley Valley. Stretch your legs and check out the waterfalls at Lost Valley. Own the road as eagles soar overhead near Kingston. Grab a snack at the Historic Ozark Cafe or the Ozone Burger Barn. See one of the best views in the Natural State at the Arkansas Grand Canyon. We recommend and Overnight in Downtown Eureka Springs at the Basin Park Hotel. Bikers Best rates start at just $99.